Review posted January 26, 2018.
words & pictures (Quarto Publishing), Lake Forest, CA, 2017. 28 pages. 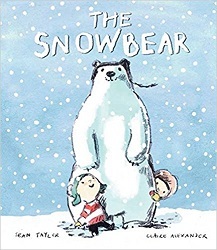 Charming, sweet, and simple – this would be a great pick for a winter storytime. It’s from the point of view of two small children, and the words and pictures are realistically childlike. When Iggy and Martina wake up to snow, they go out to play. Their mother warns them to be careful of the hill, because it’s too steep and slippery. So they make a snowman – but it ends up looking more like a snowbear. “He looks happy to be made,” said Martina. Then Iggy wants to slide down the hill on their sled. Oops! It really is too steep and slippery. They slide on and on, into the deep dark woods. Nothing moved except for one grey pigeon. “I want to go home,” said Martina. “So do I,” said Iggy. He got off the sledge and tried to pull it back the way they’d come. It was too steep and slippery. Next, there’s a wolf staring at them through the trees. It’s a scary moment. But they hear something, and an entire spread is their open-mouthed faces staring in amazement. The snowbear has come lolloping down the hill toward them! The wolf leaves, and without a word, the snowbear picks them up and carries them home. Then it goes back to where they’d made it, keeping its friendly smile all along. The ending is nice and open ended. Mom says it’s a lovely snowbear, but only the kids understand what really happened. The pictures and text work together beautifully in this tale with child-sized drama and danger – and wonderful coziness.